There’s nothing like the thrill of cruising through the city on your motorcycle. The feeling of the open air and the rumble of the cycle beneath you give you an exhilaration that is truly unmatched. 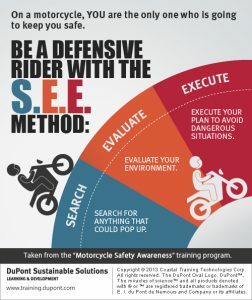 However, as we motorcycle enthusiasts all know, riding a motorcycle can be dangerous. We’ve compiled some tips to help you stay safe out there on the open road. Wear a Helmet: They may not be required in every state, but helmets save lives. A helmet is the very most important safety gear you can carry. Add an increase in protection by selecting a helmet that features a face shield or wear protective eyewear. You will reduce wind noise and they will protect you from debris. Wear Protective Clothing: There’s a lot of newer gear designed to keep you safe on your motorcycle, but leather is still an effective bit of safety protection. Reflective gear will also help ensure that you’re visible to other motorists on the road. Take a Safety Class: I know you may feel like you’re an excellent driver out there, but there’s always something you can learn. Motorcycle safety classes assist you in making wise decisions on the road, and they can often get you a discount on your insurance. Maintain Your Bike Properly: Regular maintenance lowers the risk of mechanical issues that put your life at risk out there. Properly inspect your tires, lights, clutch and throttle, brake fluid, controls and mirrors. An ounce of prevention is worth a pound of cure. Stay out of Blind Spots: Motorcycles are especially difficult to catch in a car’s blind spot. Be aware of this and drive appropriately. Watch for Road Hazards: Stay aware at all times on the road, look ahead for any hazards you need to avoid or account for: train tracks, oil slicks and potholes pose a greater risk to you than the other drivers on the street. Don’t drink and drive: You know this, but let me say it anyways to make sure it’s burned into your brain: people die when you drink and drive. You put everyone in danger when you’re under the influence and behind the wheel. Just don’t do it. Next Post: Enter to Win an Adult Easter Basket!